Many people have multiple email addresses, especially those who use email for both work and personal purposes. In the workplace, Microsoft Outlook remains the industry-leading email client, since it provides many more features than most Web-based clients do. However, if someone sends you an email, only the recipient's name is displayed on the incoming email instead of the address. This can make it tiresome for anyone using multiple email addresses, since there's no quick and easy way to find out which email address the sender used to write to you. A common problem in such a scenario is that you end up sending a reply from another address causing confusion for the original sender. 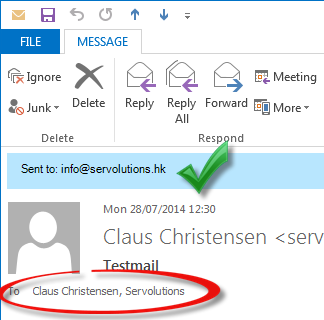 However, with AddressView, you no longer need to worry about managing multiple email accounts with Microsoft Outlook. AddressView has a simple purpose, and although it's a very lightweight tool that comes in the form of a plugin for the world's most popular email client, it provides an essential function nonetheless. It's the perfect solution for anyone who uses email for either work or personal purposes and ideal for anyone who has multiple email accounts registered to Microsoft Outlook. There is also a free 30-day trial version of the plugin available and, if you decide you want to continue using it, you'll only need to pay a one-time fee. There are no recurring charges. On the other hand, if you want to use AddressView in a large-scale operation with multiple users, you can also buy a discounted volume license for an even more cost-effective deployment. This versatile system makes the plugin ideal for any user, since it allows them to meet their individual requirements. Since it has been around for a long time, there are many different versions of Microsoft Outlook, and not everyone wants or needs to run the latest version. After all, the email client has been the industry standard for well over a decade. The sheer number of versions still widely in use often presents problems for add-ins, which are usually only compatible with one or just a few of the many versions available. As such, users normally need to update and replace the add-ins every time they upgrade to a more recent version. However, AddressView makes things easier, since it offers full compatibility with all editions of the popular email client. Installation takes only a matter of seconds too. Jonathan Jones is an entrepreneur who works with multiple email addresses on a day-to-day basis, making a plug-in like AddressView essential for his routine.